I feel like this post is a couple of weeks late now but I’ve kind of been putting it off as I know my blogging goals at the beginning of last year are so far off what I actually did that it’s not the most positive thing to look back on for last year. I’ve been trying to work on things and plan ahead and needed a break from blogging, partly planned at the beginning but then I got ill so less planned but definitely needed. I tend to make goals posts for my blog and update and change them as I go throughout the year as I see goals as a flexible thing, something that you can change as the circumstances change, and check things off as you go along and add new ones. I tended to find that whenever I set new years resolutions they seem to fail pretty early but goals with definite updates throughout the year work better for me. I don’t tend to do New Years resolutions, there’s only so many times I can put learn to drive or get healthier before it feels a bit redundant really, but I do love setting goals. I don’t just do this at the beginning of the year, for me goals are something that I keep updating and altering. If something isn’t achievable then I alter it a bit so it is, or also if something is too easy I might up the goal a bit and see if I can achieve that. Some of these goals are pretty short term and they’re all pretty all over the place. I guess I find it easiest to write goals when I have a mix of vague and long term and precise or short term goals. The combination means I have different things to focus on and some sort of become passive goals or background noise that just happen when I get into the habit of doing them. My planning has slipped a bit recently so I bought a big planner from TK Maxx a month or two ago and decided that I’d get some stickers to make it look better as I tend to keep up with it then. 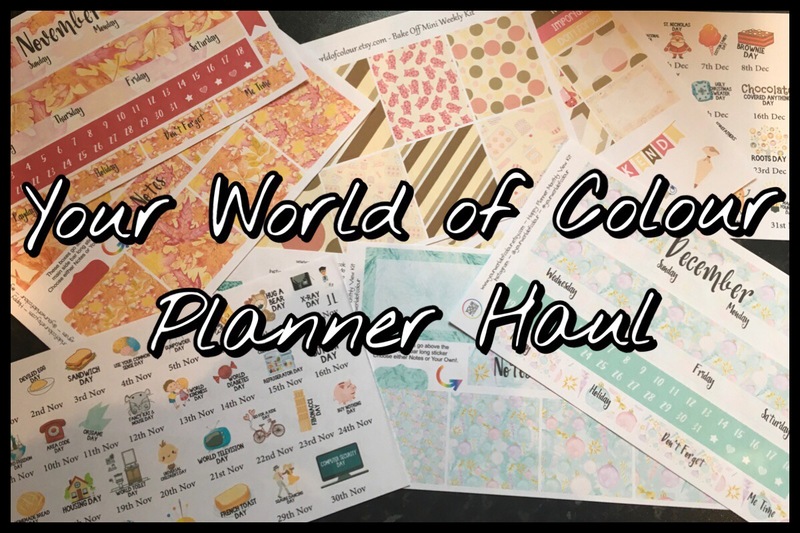 I bought a few different packs from Your World of Colour on Etsy which are designed for the Happy Planner style planners which is fairly close to the size of mine. I also found a few other sheets I liked the look of, the monthly day celebration ones are a bit different and I just love the fact there are such things as Chocolate Covered Anything Day (16th December if you’re interested in celebrating it). I’ve always loved organisers and planners, I think it comes from my mum who is definitely a lists person who has to do lists all the time. When I was at school I used to make so many to do lists for assignments and things but since leaving school, in my everyday life, I always seem to start these things with good intentions each year and then they fall apart a few months in. At least last year I lasted until September before my planner became bare with nothing but birthdays in it. This year I’ve decided to give it another go and this time it’ll be different. I may say that every year but this time I bought some new things that I love and I’ve already don’t more planner decorating than I have before. Since I first saw them I’ve always thought the Erin Condren planners look amazing and there are so many stickers out there for them. However I have my personal sized Filofax which is big enough for me so nothing ever seemed to fit. 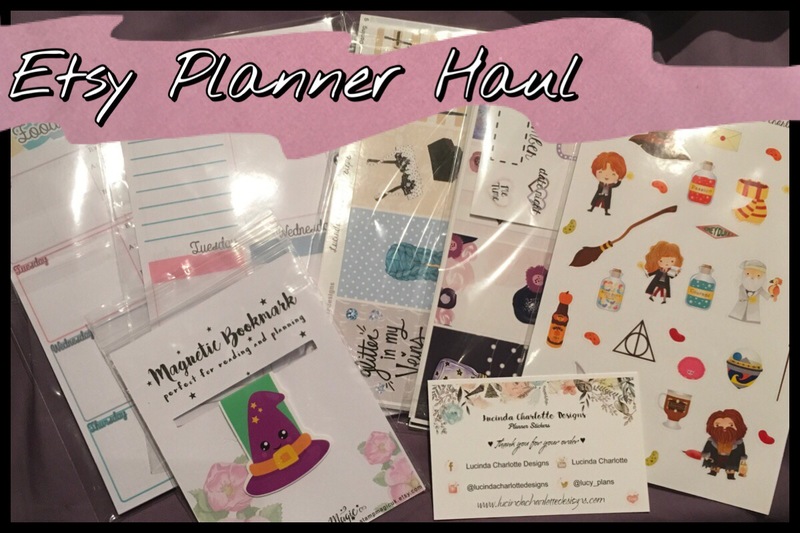 However this year I found someone on Etsy who sells inserts for Filofaxes that have the perfect size boxes for the vertical style planners in Stamp Magic so I may have gone slightly over the top in buying some things from there and another Etsy store, Lucinda Charlotte Designs.